Customers are the real asset of any organization. We Jay khodiyar Machine Tools keeps a strict vigil on entire manufacturing processes that our customer's briquetting operations running efficiently and properly. Our management believes to manage their ‘4M’s (Man, Machine, Material, Method) through '3C's (communication, co-ordination and co-operation). 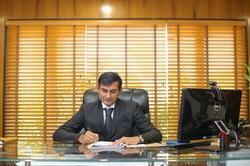 Certification of ISO 9001:2008 is the proof of our excellent management. Customer satisfaction is our best invariable policy. "There are huge challenges in today''''s globe and highly competitive markets so we have to ensure that we give the best to our clients"
We always provide positive podium to all creative ideas, efforts and technocrats to give solid form to our endeavour to make green, sustainable and cheerful global society with adoring, restive and determined journey. Jay Khodiyar Group is pioneer manufacturer in Biomass Briquetting Machine, Biomass Rotary Dryer, Biomass Turbo Dryer and Biomass Crusher. We manufacture standard briquette plant with Perfection and excellence designed to offer our clients and we strongly believe in "Customer Satisfaction". We also provide briquettes business plan for promoting green environment. 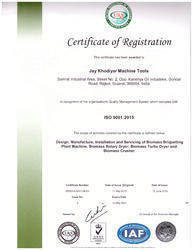 Our dedicated commitments in the span of 24 years to execute the work, restless efforts to implement innovative ideas and adoption of most advanced technologies to improve high quality standards have helped us in achieving our goal and establishing Jay Khodiyar as a successful brand name, Also Launching our new Product "Biomass Rotary Dryer" it would be unachievable without the highly Qualified Employees in the company and their continues efforts to promote sales in the company and achieve high profits with huge numbers of satisfied clients. We will always be thankful to our prestigious clients who always supported us and extended their trust and confidence that they have shown in us till today. Our organization has strongly settled its business in this domain due to our excellent quality array of Biomass Briquetting Machines since 1994. Quick processing of client's inquiries. we have covered 70% of states in India. Timely delivery of consignments within scheduled time. Product as per the customer requirement. Timely Co-ordination with the clients. Helping them to access the potential market. It takes a great team to translate the vision of “Growth With A Greener And Better Tomorrow For All” into reality. 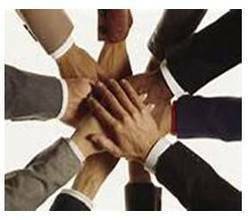 Responding to the needs of the vision is Jay Khodiyar Machine Tools' management and organizational team force that drives the growth of the company with innovative technical, organizational and management approach. Led by the exemplary leadership of MD Mr. Sanjay Tilala, the team of Jay Khodiyar Machine Tools is guided by the spirit of corporate governance through ethics, professionalism, transparency and inclusive growth.